Earl Clark Boyden, Jr, 68, a lifelong Lapeer resident went to be with the Lord on Wednesday, March 20, 2019. He passed away peacefully at his home. Earl was born September 11, 1950 in Flint at St. Joseph Hospital to Earl and Lydia (Jackson) Boyden. He graduated from Lapeer High School, class of 1969. Earl served his country proudly in the US Army. He was stationed in Okinawa during the Vietnam War. Earl came home and worked a few years with General Motors before starting his lifetime career of serving his community as a firefighter, EMT, ambulance driver and police officer. 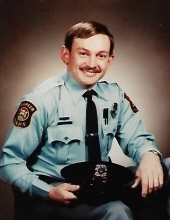 Earl worked for the Lapeer City Police Department and as a Lapeer Township officer for a total of 32 years, he retired in 2002. He was a lodge brother at Masonic Lodge #54 in Lapeer where he served as Past Master twice and Lexington Commandery. Earl loved all of his family and friends so very much – he was a story-teller and was known to play tricks and jokes on all of his big kids and grandkids. He loved his pontoon, fishing on Little Platte Lake where he enjoyed his summer with all of his wonderful friends up north and the coffee club gents. Earl also spent many years and had many adventures riding motorcycles with the “Boyden Boyz”. Earl is survived by his wife Sherry Boyden; two children: Dan (Mickki) Smith and Shelly (Andy) Engster; grandchildren: Patrick, Haylee, Samantha, Gregory Earl, Jordan, Ben and Lydia; great grandson, Bryson; siblings: Merlin (Ruth) Boyden and Rosemary (Wayne) Hamlin. Earl is also survived by many beloved nieces & nephews and a great niece & a great nephew. Earl was preceded in death by his aforementioned parents and his very beloved police dog, Brandy Boyden. Visitation will be from 2-8PM Sunday, March 24, 2019 at Muir Brothers Funeral Home, Lapeer. A Masonic service will be held 7PM Sunday evening at the funeral home. Earl’s funeral service will be 11:00 AM Monday, March 25, 2019 at Muir Brothers. Pastor Harold Hamlin will officiate. Military honors under the auspices of American Legion Post #16 Honor Guard will immediately follow the service. Memorial contributions may be made to Masonic Lodge #54, 1685 N. Saginaw Street, Lapeer, Michigan 48446. Please visit www.MuirBrothersLapeer.com to leave Earl’s family a condolence or share a memory. "Email Address" would like to share the life celebration of Earl Clark Boyden, Jr. Click on the "link" to go to share a favorite memory or leave a condolence message for the family.